Affiliate links are present throughout this post. This means that when you click and make a purchase on a link, I get a small amount of money at no additional cost to you. See my full disclosure for more details. I was intrigued by the old look of White Snow, Bright Snow, which caused me to take a look at the book. I especially love that it is a Caldecott winner. It reminds me of how much we all enjoy the snow and then long for spring when we have grown weary of the cold weather. It is a book I will definitely enjoy year after year as I use it in my classroom. I love how the book uses a very poetic feel to tell the story of a small town on a snowy day. It really captures the nature of how snow falling feels and what it is like after the snow has fallen. A beautiful and timeless story for everyone! In the book, we see the life of the citizens of a small town as they work and play in the snow. Even the rabbits have to find a way to stay warm in the cold snow. The everyday life changes as the snow falls and grows deeper. The children enjoy their time outside. Yet in the end, the citizens welcome spring as life returns to "normal" after a long cold winter. 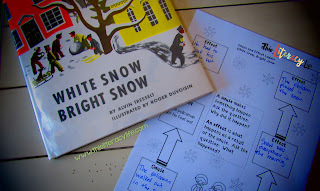 Before reading the book, I spent some time talking about how snow affects our everyday lives. Though we love it, sometimes it gets in the way. The cold snow and weather really makes us have to change so much about our day to day lives. After reading the book to the students, we discussed the causes and effects in the book and how one cause will create another effect and so on. The ladders helped the students see that as they used them. Students can also create their own with the blank templates provided. One thing I would have my students do is think of a new cause and effect that was not in the book. They would then share them with others to figure out. They may even write a story about being out in the snow and identify the causes and effects, especially how they build on each other. I will also have my students practice more cause and effect in different ways. 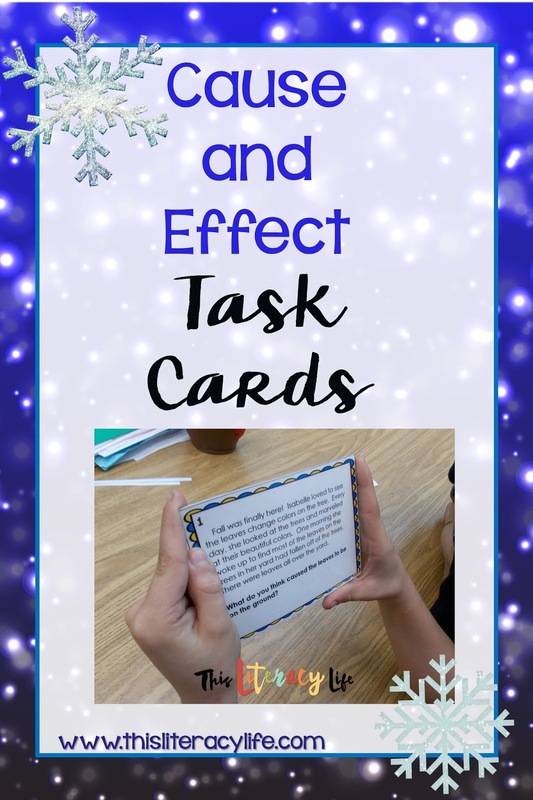 Games and task cards are always loads of fun! There is so much we can do to make cause and effect stick. 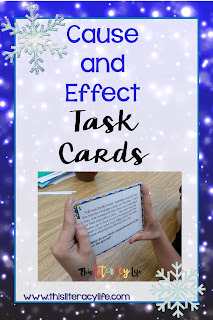 I also have these Cause and Effect Task Cards that I have used. They are perfect for helping students think critically about cause and effect. Click on the picture below to grab your free copy from my TPT store. It will be free forever, so enjoy it! Watch the video below for more tips on using the book! 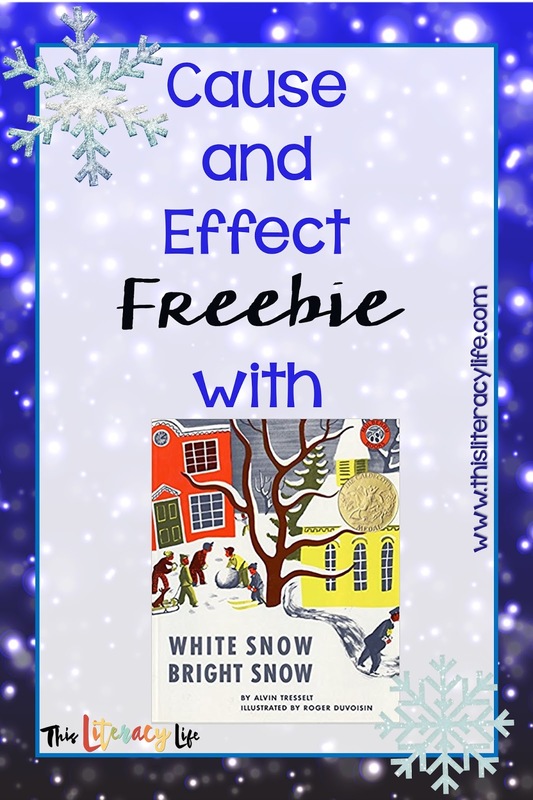 Needless to say, using the book White Snow, Bright Snow is perfect for helping students see that cause and relationships go beyond one event. Everything leads to something else. This original post was part of a link up with resources from some of my reading blogging friends. You can check out those posts by clicking on the links below. Cause and effect is so difficult to teach! Your lesson and this book will help so much. Thank you for sharing! Love that book and I actually looked at it for the blog hop but thought it would be a bit too challenging for K-2. Great choice! 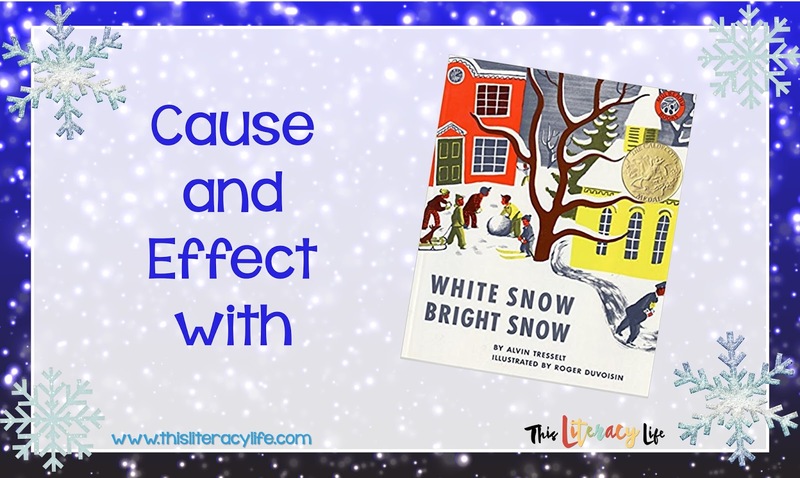 What a great book for teaching cause and effect! Thanks for helping to plan an upcoming lesson for my students! I love new resources to teach cause and effect! Thank you for sharing! What's funny is I'm pretty sure that I have this book...probably passed onto me in a pile of old books from somewhere which I always happily take. But, I have never opened it or read it so thanks for enlightening me. I'll have to find it and put it to use!